April 14, 2019 – A lightning strike releases an incredible amount of energy, most of it felt on Earth’s surface, but some of that energy travels up, far above the clouds and into space, and a new satellite is being designed by the University of Colorado Boulder to map the phenomenon. While there is no chance of an orbiting satellite being hit by errant bolts from a thunderstorm, the energy from lightning influences the ionosphere, an area of the atmosphere between 80-600 kilometers (50-375 miles) above Earth’s surface, and the magnetosphere above that, extending to 30,000 miles above the Earth’s surface. Marshall has received a four-year, $1.2 million National Science Foundation grant to develop the satellite. This research could previously only have been done by much larger and far more costly ($50 million or more) satellites. Advancing technology has made it possible for a radically less expensive solution. 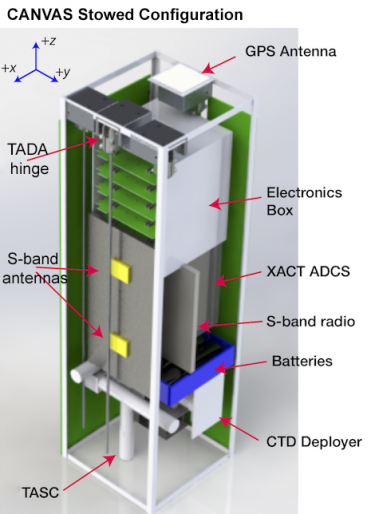 Meet CANVAS (Climatology of Anthropogenic and Natural VLF wave Activity in Space), a nanosatellite, or CubeSat, roughly the size of a loaf of bread, being tasked with the mission. Once launched, it will map these waves to determine their magnetic field intensity, electric field intensity, power level, and direction of propagation through a region of the ionosphere. As Marshall’s team develops the satellite, they are facing some unique obstacles. Chief among them is the fact that the instrument used to collect this type of data is so sensitive the satellite’s own electronics can cause interference. “The search coil has to be deployed a decent distance from the satellite. So we’re using a one meter carbon fiber boom that rolls up inside the satellite for launch and is deployed once it reaches orbit,” Marshall says. Once the data is collected, they are facing a second problem: transmitting everything to Earth. The instrument will take in up to 60 gigabytes of information every day, but the team can only communicate with the satellite during brief windows when it passes over Boulder. “We could only download far less than one percent of what it would store. So we have to process the signals it records on the satellite to reduce the data volume,” Marshall said. CANVAS will incorporate a five-channel Field Programmable Gate Array (FPGA) to do the work. The FPGA expands on an earlier design Marshall previously worked on for the VPM CubeSat, an Air Force Research Laboratory project expected to launch later this year. While not part of the CANVAS mission, the wave maps it generates could eventually be used to help predict changes in Earth’s Van Allen radiation belts, an area of dynamic populations of charged particles that encircle our planet. The radiation in the Van Allen belts can be harmful to astronauts and orbiting satellites. CANVAS is tentatively set for launch in 2022.